you and let you choose one of several options that works best for you. Remember all pre-registration (mail or online) ends midnight July 7th. We regret the error and appreciate your understanding. O'Dell, N0IRW, ARRL Section Manager. disasters and commitment to community goodwill. events, in celebration of all of the Amateur community efforts! The Texas Proclamation is posted on the WGD website. not eligible to submit entries. will look forward to seeing everyone at your local Field Day event! sponsors Main Trading Company and Austin Amateur Radio Supply). took home an MFJ Antenna Analyzer for his efforts. Award to Richard King, K5NA. enjoying the great hobby of Amateur Radio. Convention being held at the Austin Summerfest, August 3rd and 4th. these and other upcoming ARRL sanctioned events. the end of December, up .86 percent for the year." According to Sumner, the ARRL had a very positive year financially. next couple of years are unlikely to be as rosy," he pointed out. part of our fiscal equation." stage for an equally exciting Second Century." in Museum Ships Weekend June 2nd and 3rd. and Morse code, while hams around the world attempted to contact them. sometimes we are still able to use the original antennas on the ships. operations due to its proximity to salt water and lack of obstructions. full view of park visitors who were free to observe and ask questions. added a new dimension to the park. Radio Club operating from the USS Lexington, W5LEX, in Corpus Christi. participated in this weekend event. New Zealand, and an operator flying above Arizona at 38,000 feet. Tour of the Wichitas coordinator Justin, KB7CSW is looking for volunteers for Saturday, June 23. It is very similar to the Tour De Meers but it is a smaller event rider and route wise. There are 5 routes for this event. The ride starts at 7:30 and should be over by noon, so there will still be lots of time to spend on the air for Field Day. Ideally, I am looking for 2 vehicles for each of the three long routes and one vehicle for the two short routes, two for NCS and one for each Rest Stop for a total of 16. We do not need to provide anything, just ourselves and our radios. If you do have APRS capabilities that would be helpful although not a requirement. This will be another great opportunity for us to make a presence in our community and show some of our capabilities and what we can do. We will meet no later than 7:00 A.M. at the Museum of the Great Plains in Lawton for a briefing and handing out of maps and to answer any last minutes questions or handle any last minute details. If you would like to join us and help out or have any questions, send me an e-mail. From our partners in the National Voluntary Organizations Active in Disaster, of which the American Radio Relay League is a member, here's some tranining opportunities in Northwest Oklahoma. Similar training is offered in other sections of the State. Contact your local VOAD member, ex. American Red Cross, Salvation Army, etc. to learn how to partner locally. Exciting news! We are conducting a Disaster Training Institute in Guymon later this month. The Institute will include classes ranging from ones for people interested in finding out what we do in disaster, to basics for newer volunteers, to advanced classes for more seasoned volunteers. We are aiming to include students from the Oklahoma Panhandle and from across our Region and the surrounding states - Texas, Kansas, Colorado and New Mexico. Below is the schedule of classes. The Institute will also include a panel discussion and training session, "Building Partnerships to Promote Community Resiliency in Disaster," which will include students and representatives from our partners in disaster, including governmental, non-profit and for-profit sectors. For those interested in Sheltering and Liaison roles (Government Operations and Community Partnerships), there are two new classes (Shelter Manager and EOC) that will provide some great information in those areas. To enroll in a class or attend the evening event, please call the Enid office at (580) 237-5994. Welcome to summer! I know we had an eventful storm season, and there may still be a few more events left. I want to thank everyone that volunteered for all our served agencies. Whether it was storm spotting, Red Cross, Emergency Management or what ever, thank you for a job well done. Summer also brings us Field Day! This year it is June 23-24. I hope everyone has finished the final touches on their planning and have gotten the word out to the media and other outlets. West Gulf Division Director David Woolweaver and I will be making a loop around the northeastern part of Oklahoma on Saturday the 23rd. We are planning to be in Edmond bright and early that morning (I'm hoping for donuts and coffee or Diet Dr. Pepper). Then on to the Midwest City Regional Park to visit the Mid-Del ARC followed by the OCAPA site at the Citadel and out to Mustang road for the FAA group. Then it's down to Norman and the SCARS setup followed by Shawnee. We'll travel to Tulsa's Chandler Park to visit TARC/TRO and on Osage Hills Park and the Bartlesville Club. This route is subject to change for any number of reasons. Hope to see you. Also, a number of the section leadership will be traveling to other Field Day sites in the other 3 corners of the state. 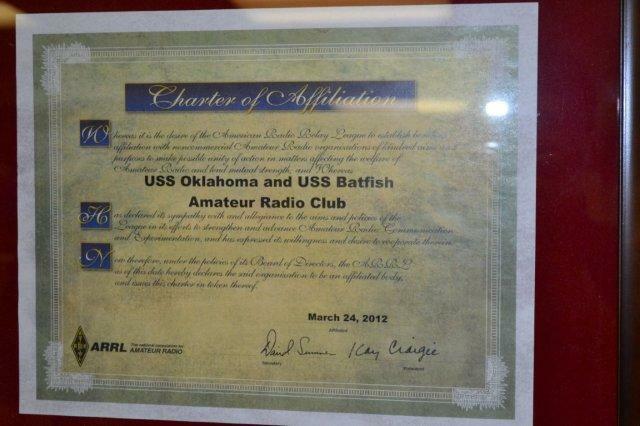 We did get a proclamation from Governor Mary Fallon declaring June 18-24 Amateur Radio Week in Oklahoma. We were also allowed a photo op with the Governor presenting the proclamation. We were the only photo being done and it allowed us about 5 or 10 minutes to chat with the Governor about amateur radio. Her father was a big time CB operator, so she understood where we were coming from as far as RF was concerned. We will post the photo as soon as we get it from the Governor's office. I just want to say that this stuff (RF) is still magical! Over Memorial Day weekend Wilma, the dog and I spent the long weekend at Camp Simpson Boy Scout Camp in southeastern Oklahoma. We had the trailer set up and I had a 20 meter dipole at about 15 feet in the trees. Then with a Ten-Tec Scout 555 at 50 watts talked to the entire east coast, the upper Midwest and Cuba. Out in the middle of nowhere, with 30 feet of wire and a little rig I paid $250 for used and made great contacts! Like I said, this stuff is still magic! Get outside and have some fun working the world! Those young people in Lawton are really blowin and goin!. 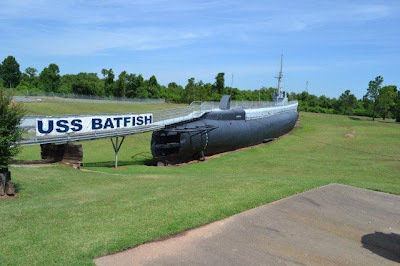 Even after the school year is out, a number of these kids participated in the Museum Ships Weekend by traveling to the other side of the state to help out the operation on the USS Batfish. Section Legislative Liaison, Eddie Manley, K5EMS was at the event. Besides having a great time, he took a few pictures. Find them at the bottom. This setup is unique as the War Memorial Museum allows the Club to broadcast from the Sub. They tell me that many others around the US do not let Amateur Radio from inside. You all missed a great opportunity and I'm sure the Vikings seemed to really enjoy it. It's official! 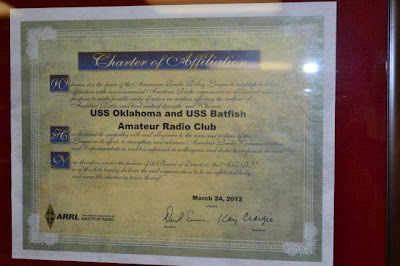 The USS Oklahoma and the USS Batfish Amateur Radio Club are ARRL Affiliated ! 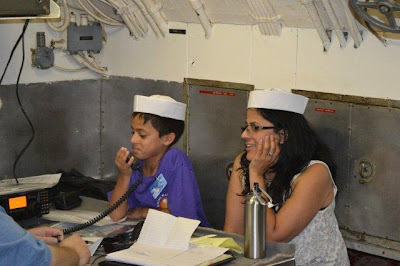 Members of the Viking Radio Club, KF5USA, traveled from Lawton to operate during the the Museum Ship event. The event also brought the attention of KJRH in Tulsa.